Like, I expect, many of you, many of the people I'm friends with on Facebook aren't particularly close. We know each other professionally or by reputation or whatever, but we've never met and only chatted occasionally online. There are two such folks I've been keen to observe recently. Or, more accurately, keen to observe what they post. We've been Facebook friends for a few years, and what they post now isn't all that different or unusual from what they've been posting, but for some reason, I've only recently put the two in direct comparison with one another. One gent is a big comic book fan. He's got the requisite 'man-cave' that's covered wall-to-wall with superhero merchandise from the past several decades. It includes a large collection of still-in-the-package Mego action figures, as well as several custom ones that he created. He frequently wears t-shirts featuring 1960s or 1970s superhero art, and has been known to cosplay as the Adam West style Batman, and WWII-era Captain America. He's also a huge Monkees fan, and has tons of material relating to them as well -- including many of the teeney-bopper magazines that featured them in their heyday. He's an artist by trade, and works out enough to cut a good figure, even in spandex. The lady is also a big comic book fan. I don't know if she has a similarly-filled cave, but she also frequently sports t-shirts featuring superhero art. Her Facebook posts tend to focus on Wonder Woman (especially Lynda Carter) and the Bionic Woman, usually linking to old photos or magazine covers. She also posts a bit about other 1970s TV shows, like Three's Company, The Waltons, and Charlie's Angels. She's not as in-shape as the gent, but she has lost a significant amount of weight in the past couple years and looks much healthier. She's a writer by trade. Superficially, there's a lot of similarities between them. There's the obvious interest in superhero comics (including current ones, I should note) but they also like a lot of material from decades-gone-by. They both show an interest in their physical health, and pursue creative endeavors to try to make a living. Their posts almost always have an upbeat tenor, and the pictures they post of themselves frequently show large and genuine smiles. But I often get a twinge of sadness looking at her updates that I don't at all get from his. The reason is nostalgia. When he posts old comic covers, it's in relation to a new t-shirt he just bought or made. His cosplay is stuff he's doing currently; how can he build a Cap costume using modern materials that still looks like it came from the 1940s. While he does post old Monkees material, half of what he posts relates to their current status. He clearly has an appreciation of a lot of older material, but he's exploring what can be done with and how it might (or might not) relate to contemporary culture. On the other hand, her posts about that older material are rooted in the past. She shows little interest in what Lindsay Wagner or Jaclyn Smith are doing today. There's no writing (of her own, or others that she just links to) that tries to re-examine those old stories using modern themes. There's seemingly no interest in re-interpretting their premises, or even looking at when someone else goes ahead to reinterpret it for us. She brings up the past only in terms of remembering how great it was back then. Like I said, they both seem to be genuinely happy, so I can't criticize from that perspective, I suppose. But if your happiness is rooted so firmly in what you enjoyed as a child that you continue to enjoy things only from that one perspective, even decades later, that seems to be living in a bit of a false reality. Nostalgia. And that strikes me as a hinderance to progress. Watchmen is argueably one the great game-changers in advancing the medium of comics. And while it's rooted in the older Charlton characters from a couple decades earlier, writer Alan Moore is very much NOT nostalgic for them and had no qualms pushing them far beyond what had been done with them before. 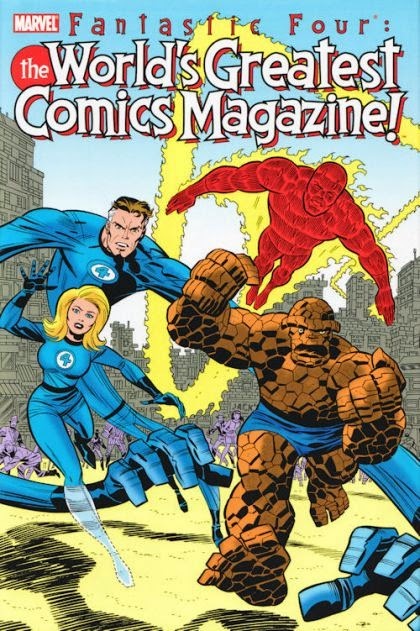 Compare that against something like The World's Greatest Comic Magazine which was very deliberately an exercise in nostalgia, trying to re-create what Jack Kirby and Stan Lee originally did with the Fantastic Four. While it wasn't a bad series, it's not especially well-remembered and certainly didn't advance the medium. It was a love letter to Jack and Stan, but ultimately one that didn't amount to anything. You're not going to find any progress (for the characters or the medium) if you're focusing on looking back at what once was. Now those two Facebook people? Like I said, I don't really know them all that well. I'm sure there's plenty that goes on in their lives that I'm not privvy to. I fully admit that I'm just basing some judgements on the very small window of their lives they allow me to look through on Facebook. That no doubt skews my view. But I can't help but think he's currently faring and will continue to fare better than her, because he's not so stuck on looking in the rear view mirror that he can't see where he's going.